A man tries to save his church by borrowing a loan. King David: You miss me? When the unemployed white journalist Paul (David Arquette), who lives in a ghetto, accidentally witness the execution of the Afro-American King David (DMX), he takes the wounded man to the hospital trying to save his life. David dies, but officially leaves his car and his possessions to Paul. Paul finds some cassette tapes in the car, and while listening to them, he becomes aware that David was a hideous drug dealer. When I decided to buy this DVD, I had no information about this movie. What a great surprise for me: it is a dark trip to the underworld of the drugs, indeed a contemporary film-noir, with sordid elements. The very dark cinematography fits perfectly to the story creating an atmosphere very adequate to the theme. The screenplay is very well written, but there are many important deleted scenes available on the DVD that explain many situations and connections of the story. DMX, David Arquette and Michael Ealy have excellent performances, but I found the character of Moon too much clichés of the powerful Afro-American drug lord. The scene of Mike leaving the tunnel in the end of the movie is another clichés that works perfectly, indicating the possible redemption of this character. 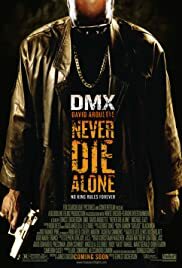 "Never Die Alone" is a surprisingly good, violent and very real movie, which does not spare the characters addicted on drugs, showing the consequence of their vicious and their destiny. My vote is seven.